Outside of your home, dirt, dust, grime and stains accumulate quickly in Minnesota’s weather extremes. Homeowners often don’t notice this slow build-up until it can’t be ignored, or until they start thinking about putting their home on the market. Proper cleaning of exterior surfaces can make an enormous difference in the appearance of your property. Cleaning up that stubborn dirt is a tough job on exterior surfaces, though. Worse, doing it improperly can damage features of your home and property, leading to expensive repairs. Home Exteriors – from vinyl siding to brick and stone, proper power-washing restores your home exterior to a like-new appearance. Garages – Let us pressure-wash your garage’s exterior and concrete floor. You’ll be amazed at the difference. Concrete Walks, Driveways & Aprons – Power-washing is the solution for cleaning all concrete surfaces, and can remove dirt, stains, and salt deposits but may not completely remove stubborn motor oil stains. Brick & Masonry – Power-washing, using the proper cleaning products, can remove hard water stains, dirt, soot, and other grime, restoring a fresh, new appearance. 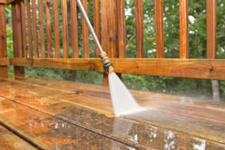 Decks & Patios – Let our pressure-washing service clean up everything from bird droppings and dirt or prepare your deck or patio for refinishing. Roofs – Used with care, power-washing can remove lichen and moss that so commonly builds up on north-facing roofs. Other Materials – From outdoor equipment and boats to barbeque gear and garden tools, power-washing by our skilled workers can clean just about any durable surface. Driveway Sealing – Let a HandyQuick specialist property seal and protect your concrete or asphalt driveway for a fresh appearance and to preserve it. Yard Clean-Ups – Our one-call handyman service can send a crew to your home to quickly clean up your yard of collected debris and unwanted materials and then haul it away for proper disposal or recycling. When HandyQuick says that it is a one-call service provider for all of your Twin Cities home maintenance, repair, and building trade needs, we mean it. Call us for any job and we’ll match your jobs with members of our extensive network of professional, trusted service providers. You won’t need to call a service provider you don’t know to come to your home. Instead, our full-service handyman company will supply a time-tested, reliable, courteous and efficient specialist or an entire crew to handle your tasks. Licensed, bonded and insured, our reputation is on the line with every job we do, so you’re assured of top-quality performance at a competitive price. Call us today and we’ll show you all we can do.